Interpret practical, theoretical and personal skills required for senior management roles within a variety of international hotel and tourism organisations. Synthesise strategic, organisational and marketing processes of a commercial hospitality enterprise within the context of the global nature of the business. Cultivate a professional management attitude by nurturing the creative development of innovative ideas and solutions. Confidently debate, research and synthesise theories while evaluating organisational learning. Critically analyse different multilateral institutions and transnational organisations including an evaluation of their impacts involved in international tourism and heritage tourism management. Entry requirements: Postgraduate Diploma in Hotel and Tourism Management or Bachelor Degree (Honours) students in any discipline, or students with substantial hotel and tourism experience and a higher education qualification. Language proficiency: Required English level by interview / HTMi test or have TOEFL 547or IELTS 6.0 or equivalent HTMi English Placement Test Score. Prior work experience: None or substantial experience in the hospitality or tourism industry if not a degree or a postgraduate diploma holder. Students who successfully complete the programme will be awarded the MBA Postgraduate Diploma in Hospitality Management by HTMi Hotel and Tourism Management Institute. 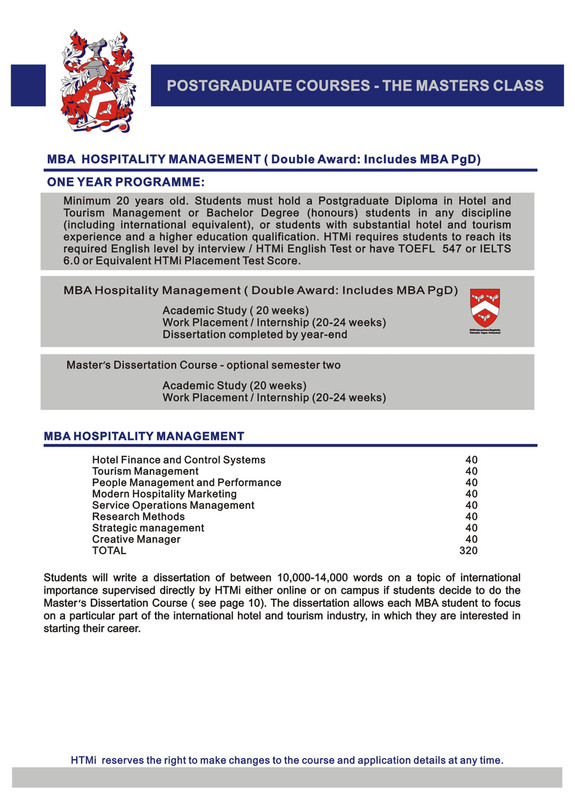 MBA Postgraduate Diploma graduates need to complete a dissertation to be awarded the Master of Business Administration (MBA) in Hospitality Management by HTMi Hotel and Tourism Management Institute. Students will write a dissertation of between 10,000 – 14,000 words on a topic of international importance supervised directly by HTMi either online or on campus if students decide to do the Master’s Dissertation Course. The dissertation allows each MBA student to focus on a particular part of the international hotel and tourism industry, in which they are interested in starting their career. Masters students may choose to join the optional Dissertation Course following the completion of the taught course.